As they age, many peopled develop fine lines and wrinkles, deep lines and facial hollows. That is especially true here in the dry climate of Inland Empire, CA. If this is happening to you, what’s your best solution? When facial aging advances past a certain point, a facelift is the only good solution. But even a great facelift can still leave you with facial hollows if volume loss is also a problem. In addition, many don’t yet need a facelift. You may have heard that fillers like Restylane®, Juvéderm® and Bellafill can help with the kind of fine lines, deeper lines, wrinkles and volume loss that are common in Inland Empire. That is certainly true. But which filler works best in each situation? Which one would be best for you? Years of training and practice here have helped me gain some knowledge I’d like to share with you. The major reasons for facial aging are sun damage, loss of key skin factors and volume loss. 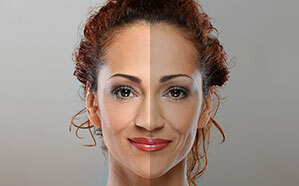 Ultraviolet light from too much sun often damages skin. By the time we hit 30, our skin produces less collagen and elastin. Elastin helps skin stay firm, and collagen is the building block for new skin. As their levels decline, our faces start to show their age. What makes this worse is that our bodies stop depositing fat in the fat pads below the surface of our faces and puts it elsewhere, usually where we don’t want it. Those fat pads provide the rounded edges that make you look younger and more attractive. As they shrink, your features begin to look sharper and less appealing. Fine lines, deep lines and wrinkles begin to appear. If these problems are pronounced, a facelift, blepharoplasty, browlift or neck lift can make you look years younger. These surgical procedures will tighten your skin. But they won’t restore lost volume under the skin. If you’re in your 30s or 40s, replacing volume loss may be the main thing you need to look more attractive. Fillers like Juvéderm®, Restylane®, Radiesse® and Bellafill can work well, certainly here in Inland Empire’s climate. To learn which one could be the best to remedy your facial aging, read on. If you want to smooth wrinkles, soften facial lines and restore youthful rounded features, fillers are an excellent choice. But please note that you’re having a foreign substance injected into your body. Clearly, you only want to use a filler that’s FDA-approved for the area you want to improve. It’s vital to choose the right filler for the job. You also want to choose a doctor who is skilled and experienced at injecting fillers. 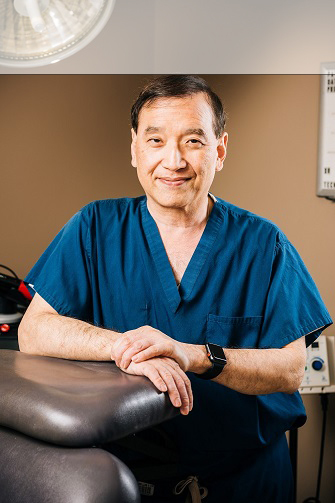 Board certified facial plastic and plastic surgeons, as well as cosmetic dermatologists, are trained in the most up-to-date and safest techniques. If you really want to improve your appearance, chose a doctor from one of these specialties who has a lot of experience in injecting fillers. It is unwise to try and save a few dollars by using an under-trained or under-experienced injector. Remember, everyone you meet will see your face. The easiest fillers for your body to accept are based on natural body substances. Artificial fillers like silicone may seem like a great idea. After all, they’re permanent. But silicone can migrate to other areas in your face where you don’t want it. It can also cause inflammation. Either of these issues can lead to disfigurement. And if you need to have silicone injections removed, you must have surgery. That can lead to a build-up of scar tissue. These are the kinds of problems that create the horror stories we read about in the media. Liquid silicone injections can save you money, but they can also lead to the kind of new look you clearly don’t want. Juvéderm®, Restylane®, Radiesse® and Bellafill are all FDA-approved to restore facial volume and soften or eliminate lines and wrinkles. They’re based on natural substances that the body readily tolerates. Juvéderm® and Restylane®, for example, are based on hyaluronic acid. This fluid is found in your eyes and joints. Since they’re similar to substances the body manufactures, most easily accept these fillers. In fact, your body will absorb hyaluronic acid fillers a little at a time after injection. In about a year you’ll need to schedule another round of shots or wrinkles, hollows and lines will again start to become visible. Radiesse® can last for some 18 months. It’s based on calcium hydroxylapatite, essentially the mineral that naturally strengthens human bones. Radiesse® contains calcium microspheres that provide the initial volume. In time, collagen forms around the microspheres. This allows it to last longer than hyaluronic acid fillers. Bellafill, in contrast, has tiny, round particles of PPMA (a key ingredient in bone cement used in orthopedic procedures) suspended in bovine collagen. Bovine collagen was once the most popular filler because it provides instant, outstanding results. In a few months your body will absorb the bovine collagen. But while that is occurring, the PPMA particles in Bellafill will attract your body’s own natural collagen. It begins to form around the PPMA microspheres. This allows Bellafill to last for up to 5 years or even longer. Which Filler is Your Best Option? While these are general guidelines, the final filler selection depends on your individual needs. If you want to instantly look your best, I’d recommend a hyaluronic acid filler like Juvéderm® and Restylane®. If your lines, wrinkles and facial hollows get overfilled, we can eliminate that problem immediately by injecting a different substance. You can walk out of the office with exactly the great new look you want. But if you have time and want the longest lasting, most cost-effective solution, I’d recommend Bellafill. Although it initially costs more per injection, Bellafill can last 5 years or longer. You won’t have to come back for new injections every year, as you would with hyaluronic acid fillers. Since neither Radiesse® nor Bellafill can be reversed, I prefer to inject patients progressively. That way, you’ll look better right away, but we won’t have to worry about over-filling your wrinkles, lines or hollows. We can use the next injection to get you exactly the new look you want. With Bellafill, that new look could last for 5 or more years. Since Bellafill is based on bovine collagen, you’ll need to be tested to make sure you’re not allergic to it. If you are, Radiesse® will last longer than Juvéderm®, Restylane® and other hyaluronic acid fillers. In any event, if you have fine lines and wrinkles, deep lines or volume loss and you’re looking for a board certified facial plastic surgeon who’s experienced in injecting Juvéderm®, Restylane®, Radiesse® and Bellafill in Inland Empire, you can find me at STC Plastic Surgery in Ontario, CA. Should You Choose a Necklift + Facelift?